I've spent the last couple of days revisiting Wasteland, the mythical world of forgotten Disney dreams, in the new Epic Mickey installment, Epic Mickey 2: The Power of Two. A few hours into the game, I was already tiring of it. Despite the added dimension of tandem play between Mickey Mouse and his new best friend Oswald the Lucky Rabbit, Epic Mickey 2 really breaks no new ground in the franchise. Like its predecessor, it looks great with plenty of clever and imaginative visual treats that will impress any bona fide Disney geek (I'm particularly fond of the Pink Elephants on Parade that populate various hidden rooms and secret passages on Mean Street, Epic Mickey 2's twisted take on Main Street, U.S.A.), but that still doesn't change the fact that the game is bogged down with tedious and repetitive game play that feels exactly the same as the first installment. In Epic Mickey 2, the intrepid mouse is called back to Wasteland to help save it once again from epic destruction. This time, the world is being ravaged by earthquakes and strange forces that the villainous Mad Doctor from part one says he can fix (in song, no less) with the help of some friends with heart. Has the Doc turned over a new leaf? Should he be given a second chance? Personally, I don't trust him--and neither do the characters of Wasteland. Equipped with his trusty magic paint brush, Mickey sets out to repair the damage and solve puzzles using paint to build and create and thinner to erase and destroy. By his side, he also has Oswald, who can use a remote control to activate machines and zap bad guys with electricity. Oswald automatically tags along with Mickey in single-player mode, but he's definitely more useful when he's under the control of a second player. How the duo uses the tools at their disposal determines the direction of the game play. There are always choices to make that affect future outcomes. If most of this sounds familiar, it's because it is. 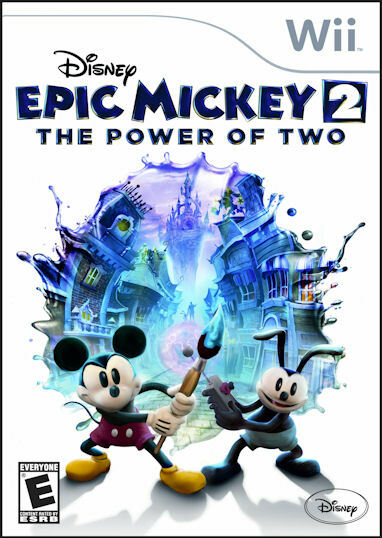 The Power of Two is basically the first Epic Mickey with a two-player mode and different scenery. It does make some improvements from the original, like better camera movement and real dialogue in place of the gibberish characters used to spout (Frank Welker does a fine job voicing Oswald). It also adds interesting new areas to explore like Disney Gulch (Frontierland), Fort Wasteland (Tom Sawyer Island), and especially the best lands of the bunch, Rainbow Falls and Rainbow Caverns, which are at once homages to Disneyland's Mine Train and the Seven Dwarfs' Mine. I was also partial to this boss encounter with a maniacal, mechanical Pete's Dragon in Main Street Electrical Parade mode. Still, this is all window dressing for a game that makes you slog through quest after repetitive quest--all reminiscent of the original Epic Mickey--to get to the good stuff. This may play well for gamers who missed out the first time (Epic Mickey was only available on Wii; Epic Mickey 2 is available across all major game console platforms), but if you've played Epic Mickey already, The Power of Two is going to feel more like an expansion pack of additional worlds than a full-blown original game. I had high hopes for Epic Mickey 2. I came away disappointed. 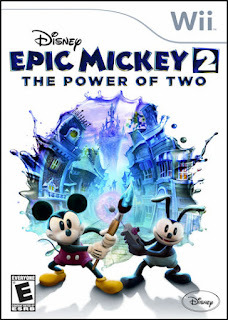 Epic Mickey 2: The Power of Two will be available tomorrow for Xbox360, PS3, Wii, Wii U, PC and MAC.